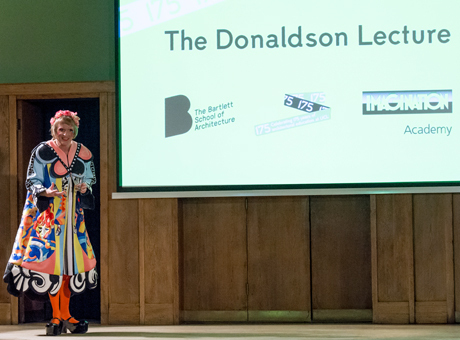 Artist Grayson Perry delivered the first ever Donaldson Lecture before a packed audience at Conway Hall on 13 January 2016, launching a programme of special events celebrating 175 years of architectural education at The Bartlett School of Architecture, the founding school of The Bartlett, UCLʼs Faculty of the Built Environment. To a rapt audience Perry presented (what he termed) 'some random subjective, celebrity thoughts vaguely related to architecture'. From ideas on taste, to the creation of House for Essex with FAT architecture, to skeuomorphism, to masculinity, he delivered a memorable lecture that sought to draw links between the built environment and the wider world. The winner of the coveted RIBA Donaldson Medal for the best BSc Architecture student at The Bartlett School of Architecture was also announced on the night. Douglas Miller, a BSc Architecture UG7 graduate, was presented the award by RIBA President, Jane Duncan. Earlier in the year he received a High Commendation at the RIBA President's Medals in the Bronze category for his 'San Francisco Columbarium' project. The Donaldson Lecture is a major new annual public lecture named in honour of Thomas Leverton Donaldson, who in 1841 was appointed UCLʼs first Chair in Architecture, one of the first in the UK, founding what later became The Bartlett School of Architecture. The School's Bartlett 175 celebrations continue with the 'Open Critsʼ, a series of all-day crits of student work, with invited critics from architecture, design and the media. April sees the launch of a special publication in conjunction with Architectural Review, celebrating the history of the School and the work of notable staff and alumni. Following the launch the School will host ʻaae2016ʼ a major international conference on the theme of ʻResearch-Based Educationʼ by the Association of Architectural Educators.